Later topic: did Vandercook make the Nolan Presses? Earlier topic: ATF type faces- viewable online? 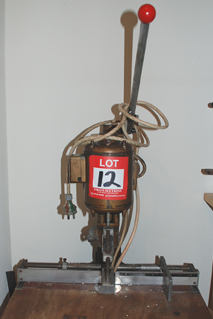 I bought a second hand and quite old looking paper drill through an auction. It’s still working fine, but I want to change the paper drill bits to 3.5mm. Does anyone know how to unscrew and change the paper drill head? or what model of paper drill bit that is needed for this machine? I tried to look for the brand, but all I can find is ” Gryphon Brook Motor Huddersfield”. I have not seen this particular paper drill personally, but most US drills have a hole in the collet just above the top of the bit. One inserts a bevelled steel rod (drift pin) or screwdriver in the hole and puts pressure on the top of the bit by raising the outboard end of the pin. The bit should pop out of the collet and one can then place a new bit into the collet. If your drill has a multiple jaw collet, however, there should be a way of loosening it by twisting it. All the drills I have used have had the solid collet and drift pin removal of the bit. My drill has a set screw that holds the bit in place. The set screw receives an allen wrench. The pics you attached shows flat areas on the collet and on the bit. These areas are usually put there if you need to use 2 wrenches to loosen the bit (one to hold the collet in place and another to unscrew the bit). This would lead me to beleive that the bit is threaded and unscrews. But personally, I’ve never seen bits like this. I will try to use the drift pin and 2 wrenches tricks tonight.